The island is open to visitors every day year-round except for Thanksgiving, Christmas and New Year’s Day. Although there is not an entrance fee, there is a charge for the ferry service, supplied by a private company under contract to the National Park Service. For additional information on schedules, prices, parking, and to purchase tickets in advance (tickets are made available about 90 days in advance) please visit the Alcatraz Cruises website. Alcatraz frequently sells out, as much as a week in advance, in summer and near holidays. 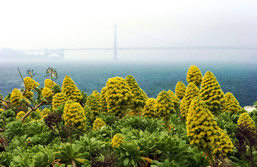 The best time to visit the Gardens of Alcatraz is from January to September, and especially in the spring. 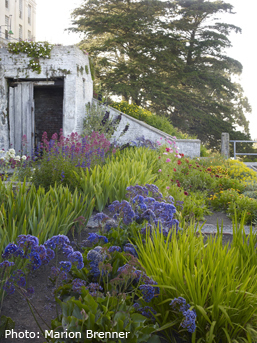 The gardens are open for viewing, however, all year round. The weather can be unpredictable so be prepared for wind, cold, or rain. For more information on the island’s weather, click here. We offer docent-led tours of the island gardens twice a week on Friday and Sunday mornings at 9:45am, starting at the Alcatraz dock. Take the first or second ferry departure of the day from Pier 33. The tours lead you through all the restored gardens, including those that are off limits to most visitors—Officers’ Row and the Rose Terrace. Visitors also have access to Officers’ Row every Wednesday from 11:00am to 2:00pm, when a docent is present to answer questions. If you are interested in scheduling a garden tour for your group, send an email to SFritz@ParksConservancy.org. 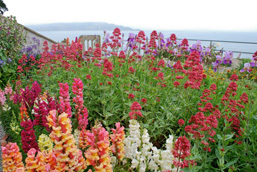 The Garden of Alcatraz brochure (PDF) is available at a few locations on the island. It is also distributed to participants of the docent-led tours. The brochure is also available in French.